Recently I had the pleasure of roaming through Southern Utah- a geologic wonderland of mouth gapingly spectacular rock formations. However the hardness of the tap water meant generally unsatisfying brews and I just stuck to my summer assams and matcha in the morning even though I had optimistically brought a giant grab bag of puerh. Drinking uninteresting teas in the morning was no sacrifice to partake in the visual marvels of Capitol Reef and Zion. We chose to return home from Salt Late City on a sleeper car on the California Zephyr - a long held wish of my husband to ride through the Sierra Nevada. After the utterly mind blowing scenery of Utah, I was underwhelmed by the endless stretch of pine trees. While we traveled in benign comfort, early pioneers perished in traversing the treacherous gap of the Donner Pass. 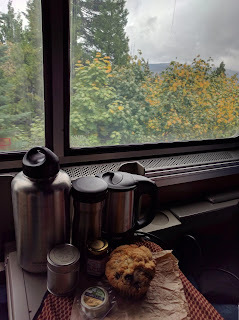 Going West used to be an exceedingly dangerous enterprise and I am grateful the only fear I had was the worry of blowing the circuits with my electric tea kettle. Our two seat roomette came with a standard 120 volt outlet and I happily had boiling water at my command. I brewed matcha for myself in my thermos with vigorous shaking and oolong for my husband. At higher altitudes, you have to boil for longer to compensate. But since oolong and matcha require lower brewing temperatures, a quick boil at ~7000 feet appeared to be just right. Our taste buds tend to be less receptive at higher altitudes beyond 5000 feet so I had low expectations. 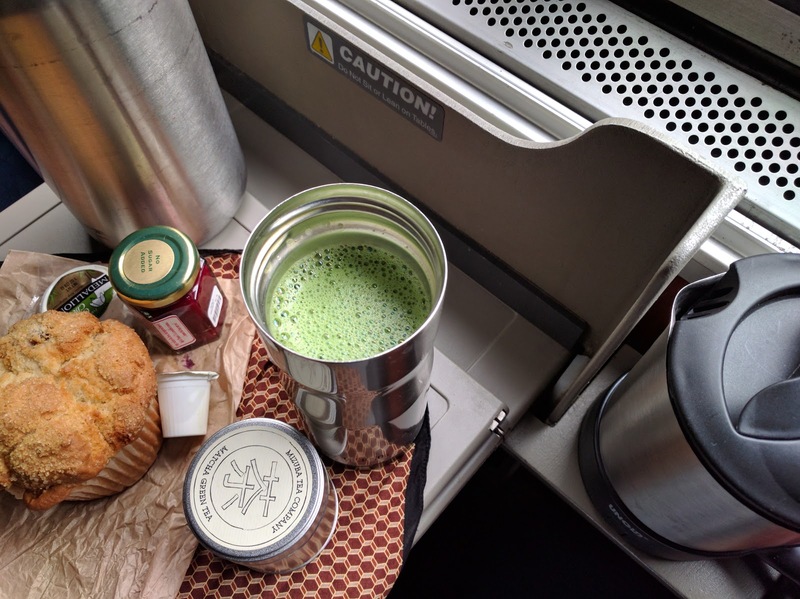 However the novelty of having my daily matcha latte on a train made me giddy. My German Unold kettle has been one of the top indispensable devices on this trip. Even though we had lodgings with full kitchens, those kitchens lacked a reasonable way to boil water. Keurig machines are the norm now and the cabins were equipped with teflon pots which I normally avoid like the plague. I am so satisfied every time I use this kettle that all my minor complaints about it's bulkiness melts away. My husband after a quick look said he could replace the hefty plug attached to a EU/US adaptor with a standard US electrical cord from the base. It is closed with a split head screw to prevent casual opening of the kettle so my husband said he'll make me a split head screwdriver tomorrow.